Culms: Stiffly erect, often bent below, hollow, glabrous, minutely rough at summit; base somewhat swollen or bulb-like. Blades: Flat at maturity, saber-shaped, 2-12 inches long, to 1/3 inch wide, glabrous to rough; margins rough; tips tapering to points; top blade shorter than others, extending sharply upward. Sheaths: Open, glabrous, distinctively veined, not keeled, often exceeding internodes; base often purplish. Ligules: Membranous, to 1/5 inch long; auricles absent. Inflorescences: Panicle, slender, spike-like, cylindrical, very dense, 2 to 6 inches long, to 1/3 inch thick. Spikelets: Crowded, 1-flowered, elliptical, flattened, stiff-hairy; glumes nearly equal, to 1/8 inch long, membranous, keels coarsely-fringed; tips with stout awns; glumes form "U" where 2 glumes meet; lemmas about 1/2 as long as glumes, delicate, membranous, awnless. Habitat: Pastures, meadows, fields, roadsides, lawns, waste ground, and ditches; moist fine-textured non-saline soils. Distribution: East 5/6 of Kansas. Origin: Native to Europe. Widely planted as a hay crop and escaped from cultivation. Now naturalized throughout the U.S.
Reproduction: Reproduces from seeds and tillers. Forage Value: Good to excellent forage value for livestock and deer. A palatable grass cultivated for hay and pasture use. Uses: The Navajo used the stems to make hair brushes. Comments: Timothy is a short-lived perennial that forms large clumps. Named for Timothy Hanson who lived in Maryland and introduced the grass around 1720. Timothy is not drought tolerant. 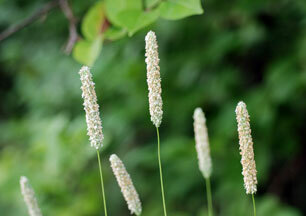 It is known to produce large amounts of pollen and is a primary contributor to allergy symptoms.